WASHINGTON (Reuters) - U.S. President Donald Trump threatened again on Monday to shut down the federal government over his demands for a border wall and other changes in immigration policy, but said he remains open to talks with Congress on the issue. 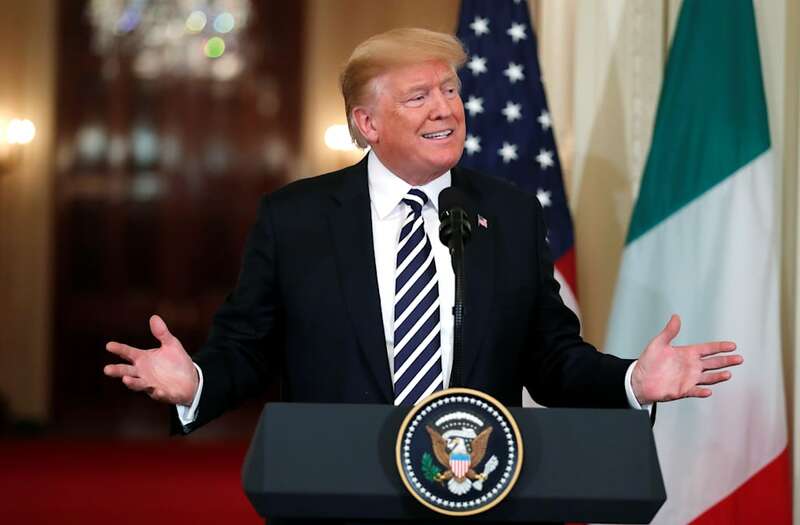 "I always leave room for negotiation," Trump said during a press conference with Italian Prime Minister Giuseppe Conte at the White House, adding that he has drawn no "red line" on the matter. Congress must pass a spending bill by the end of September to avert a government shutdown, and Trump on Monday reiterated his demand that immigration reforms, including $25 billion for construction of a wall on U.S. border with Mexico, be included in any spending package. "If we don't get border security, after many, many years of talk within the United States, I would have no problem doing a shutdown," Trump said. Beyond building a wall, the administration also wants to do away with so-called "chain migration" allowing relatives of immigrants to come to the country, and the diversity visa-lottery program, and to move toward what Trump calls a "merit-based" immigration system. The Republican president said on Sunday he would allow the federal government to shut down if Democrats do not fund his border wall and back immigration law changes, betting that maintaining a hard line will work in Republicans' favor in November congressional elections. However, a disruption in federal government operations could backfire on Trump if voters blame Republicans, who control Congress, for the interruption in services.